Daddy: "Here is the place where we can donate our blood, honey." We saw the morning news on TV today and learned that Red Cross is going to be at the Orleans casino for blood drawing. It's hard to guess you can donate your blood at Casino, but it's true. Our schedule was a little tight, but we decided to hurry and go. We ran and arrived there 10 min before the end, but they already had 10 people sitting and waiting in front of us. We couldn't make it in time this time, but good news is they had many people donated blood. Daddy: "We are so close to Strip. Let's go see the Bellagio decorations now♪"
Mommy: "Darling? Did you know my favorite flower is Sunflower?" Daddy: "Of course, I know." Daddy: "Isn't it amazing the cakes on the side of the lady are made of actual chocolate?" Mommy: "It is. They are both so beautiful♪"
The Doggies were waited us for a few hours in the house. It was another warm day, but they really wanted to go in the water. So I decided to let them in for a little while. Kahlua: "How's the water, Kona?" Ehime: "Look. I can hold two in the water♪"
Kahlua: "I can hold one on the land♪"
Kona: "I can hold two both in the water and on the land. He he♪"
Kona: "Phew, its' hot. I'm getting tired." Mommy: "I'm sweating a lot, too. Let's go back in the house." Mommy: "Ehime... are you drowning?" 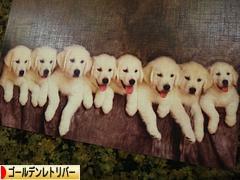 For Ehime who wanted to play in the water more, please click the puppy photo on the right above or a dog picture below. Thank you!